↑ ক খ Christmas Island and Cocos (Keeling) Islands are Australian external territories in the Indian Ocean southwest of Indonesia. 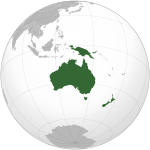 ↑ Papua New Guinea is often considered part of Australasia and Melanesia. It is sometimes included in the Malay Archipelago of Southeast Asia. ↑ On 7 October 2006, government officials moved their offices in the former capital of Koror to Melekeok, located ২০ কিমি (১২ মা) northeast of Koror on Babelthuap Island.